Starting a business takes more than just a great idea. It requires sound financial planning and careful consideration of the steps you need to take to get you there. Here’s how one T.E. Wealth client reached for the stars, and grabbed them. With that kind of money on the line, you’ll want to make sure the company you hire is reputable and reliable – but how? HomeStars connects homeowners with reputable contractors who provide services like renovations, interior design, pest control, landscaping, cleaning and more. There are over 8,000 reviews by real homeowners added each month to HomeStars.com. Using a recommendation score of 1-10, HomeStars acts as a referral service that lets users rate their experience with service providers, and includes how that information was obtained. It tells you the stuff you really want to know – like whether a company has ever bullied or cheated a client. If you’re like me, you’re probably thinking, “This is genius! Why didn’t I think of it?” I had the privilege of speaking with the genius who did, Nancy Peterson. This is her story. 1. What prompted you to go the entrepreneurial route, and why this business in particular? I was doing home renovations and saw that nothing existed (besides the phone book) in terms of info on companies that did home-related contract work. I wanted more background info, like details on past behaviour and work quality. I’d been working at Kraft Foods in marketing for over a decade, and we spent so much effort on branding and informing people on products like cream cheese and salad dressings – and those cost only a fraction of what I was about to put down for my renovation. It got me thinking about how one might codify word-of-mouth recommendations in a way that lets you look at the past work and behaviour of contractors before hiring them. 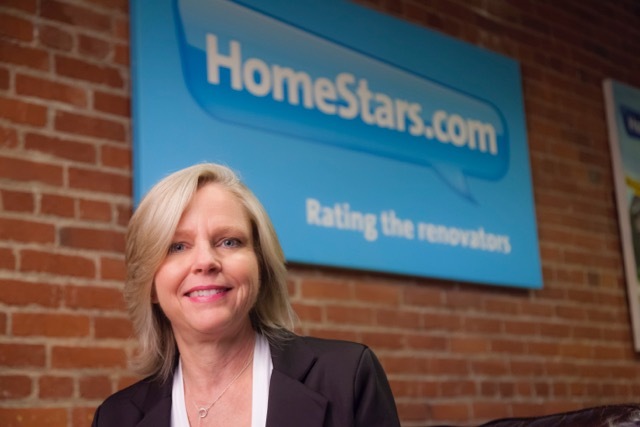 In 2005, I started working on the concept and launched HomeStars in 2006. I left Kraft and went all in. At the time, I was the only one doing this – even Yellow Pages didn’t have reviews. 2. Did you have any misconceptions about starting your own business? I discovered that raising money takes a lot longer than you think. I needed to invest a lot of my own personal capital in addition to the money I received from investors to make it work. In the end, it took about six figures to get the business off the ground. 3. What financial issues did you consider during the research phase, and what resources did you draw on to make decisions for your business? I was fortunate enough to have been approached by a venture capitalist who was interested in my business. I didn’t end up working with them (because they wanted a co-investor), but I used that experience and the term sheet they’d given me to get help from Maple Leaf Angels (MLA). MLA helped connect me with private investors who supplemented my own savings. I also consulted with a lawyer, my T.E. Wealth financial planner, a financial model builder, an SEO (Search Engine Optimization) specialist and a web developer. Given my background in marketing, I was able to build my own sales and marketing plan. I piloted a basic site in Toronto but launched it in Boston because, in 2006, it was easier to raise money in the U.S. than in Canada. Boston seemed like a good place to start because it’s the same time zone, has a good-sized market, and I was able to hire a community manager based there. 4. In hindsight, is there anything that you would have done differently? I would have only launched in one market – Toronto. It would have been much easier to manage because I live here. 5. What has been the most rewarding aspect of having your own business? Helping people find great services. A lot of people have thanked me for helping them take the stress out of finding a contractor. The site has also helped companies get positive exposure. One client, who advertises on the site, told me that someone had posted an excellent review of their business. This helped them attain new business and get back on their feet again after a long slump. 6. What advice would you give to someone who is thinking about starting a business? Plan to raise money for a good 18 months. Think about what your objectives are and what you’re trying to achieve. Don’t lowball yourself because you need to have money for the things you plan for – and extra cash for the things you don’t. As you start your business and learn more about running it, new costs that you didn’t anticipate inevitably come up. Also, be very careful with whom you bring in as partners and employees – it’s easier to date than get married! Make sure you have the same vision, values, commitment, energy and that you have complementary skills. You really have to trust each other and be able to resolve conflict in an amicable, but effective, way. Lastly, be in love with what you’re doing. Because you’ll be spending a lot of time doing it! 7. How do you keep yourself motivated and inspired when things aren’t going as you’d like? My husband has been very supportive since the beginning, and I spend a lot of time with good friends in a variety of activities to de-stress. I also love spending time with my dog – who’s always happy to see me. When you’re running your own business, you have to just expect a roller coaster and enjoy the ride! This article was published in T.E. Wealth’s Strategies newsletter, Nov 2016 edition. Read the full edition here.